St. Catharine glorified God by an illustrious confession of the faith at Alexandria under Maximinus II. Her acts are so much adulterated that little use can be made of them. The Emperor Basil in his Greek menology relates that this saint who was of the royal blood and an excellent scholar, confuted a company of the ablest heathen philosophers, whom Maximinus had commanded to enter into a disputation with her, and that being converted by her to the faith, they were all burnt in one fire. He adds that Catharine was at length beheaded. She is said first to have been put upon an engine made of four wheels joined together, and stuck with four sharp pointed spikes, that, when the wheels were removed, her body might be torn to pieces. The acts add that, at the first stirring of the terrible engine, the cords with which the martyr was tied, were broken asunder by the invisible power of an angel, and the engine falling to pieces by the wheels being separated from one another, she was delivered from that death. Hence the name of St. Catharine's wheel. The body of St. Catharine was discovered by the Christian's in Egypt about the eighth century. It was soon after translated to the great monastery on the top of Mount Sinai in Arabia, built by St. Helen. Falconius, Archbishop of San-Severino speaks of this translation as follows: 'As to what is said, that the body of this saint was conveyed by angels to Mount Sinai, the meaning is that it was carried by the monks of Sinai to their monastery, that they might devoutly enrich their dwelling with such a treasure. - It is well known that the name of an angelical habit was often used for a monastic habit, and that the monks, on account of their purity and functions, were anciently called "Angles".' From that time we find more frequent mention made of the festival and relics of Saint Catharine. In the eleventh age, Simeon, a monk of Sinai, coming to Rouen to receive an annual alms of Richard, Duke of Normandy, brought with him some of her relics which he left there. The principal part of the mortal remains of this saint is still kept in a marble chest in the church of this monastery in Mount Sinai. Taken from "Lives of the Saints" by the Rev. Alban Butler, abridged version, 1990. On St. Catharine's Day, it is customary for unmarried women to pray for husbands, and to honor women who've reached 25 years of age but haven't married -- called "Catharinettes" in France. Catherinettes send postcards to each other, and friends of the Catharinettes make hats for them -- traditionally using the colors yellow (faith) and green (wisdom), often outrageous -- and crown them for the day. Pilgrimage is made to St. Catharine's statue, and she is asked to intercede in finding husbands for the unmarried lest they "don St. Catharine's bonnet" and become spinsters. The Catharinettes are supposed to wear the hat all day long, and they are usually feted with a meal among friends. Because of this hat-wearing custom, French milliners have big parades to show off their wares on this day. And grant that I never may die an old maid. I know of one woman that would say that Aunty Catherine dealt her a bad hand! Isn't it interesting that Aunty Catherine is the patron(ess) of Christian philosophers? I'll bet she was a feisty one! Isn't it interesting that Aunty "Little Flower" (who never left her Carmel) is the patron(ess) of missions and missionaries? I don't think it's an example of God's sense of humour! A confoundment of pompous prejudices, perhaps? Editorial note: The cult of St. Catharine of Alexandria was suppressed in the Roman Catholic church in 1969. 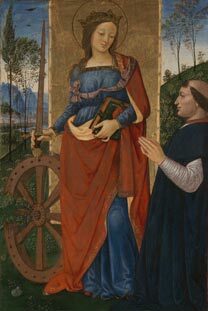 She's depicted in paintings, with her wheel, alongside St. Thomas Aquinas! How did she become associated with this? It seems she'd mostly be invoked by female students, asking her for her intercession in their studies. Apparently the cult was suppressed due to details of her story being put down as legend. The usual excuse. Her feast and mass was removed from the Roman Calendar in 1969. However, I have found out since the original post (which was referenced from a pre Year 2002 book) that in 2002 her feast was reinstated. They found reason to be believe that her life was now not a legend. Go figure as they say. Well, I have done some research and come up with the following explanation as to how St Catharine became a patron of unmarried women.
" In France, in fact, the saint is celebrated in an even wider way. Considered under the protection of Saint Catherine, in the Middle Ages girls showed their devotion by making beautiful headgears aimed at her statue for the celebrations taking place every November 25th. When married, young women used to leave the group, and people started calling “Catherinettes” the ones who after 25 were still single. While this practice has now faded away, every November 25th unmarried women still celebrate this festival by wearing Saint Catherine’s headgear and on that day they are still called Catherinettes, although probably, if in the Middle Ages being single at that age was a problem, now very likely it means that such young women have a promising career awaiting them."